Car accident mortality rates for infants (children less than one year old) by an astounding 71 percent. Car accident mortality rates for toddlers (aged one to four years old) by 54 percent. When put into perspective, a few annoyances are worth the protection. The reason you have been hearing more advocacy for proper car seat use is because not enough people are following the rules. Over one-third of children under the age of 13 who are killed in car accidents are not properly strapped into their car seat or wearing a seatbelt. As much as you don’t want to swear in front of your child, protecting them should be your #1 priority. Whether you are on your first child or your fourth, proper right research into the perfect car seat is a must. Safety standards, size, and consumer reports are just as important (if not more important) than ease of use. Unfortunately, most parents think they are using the right car seat—and using it correctly—without doing the proper research. To read the manual. Always read child seat manufacturers' instructions and the vehicle owner's manual for important information on height and weight limits and how to install the car seat using the seat belt or the LATCH system. To place the seat in the correct position. All children should be placed in a rear-facing car seat for as long as possible for the seat’s height and weight limits. Once the child is big enough you can transition him into a weight-appropriate forward facing seat. Children under 13 should ride in the back seat, and children in rear-facing car seats should never ride in front of an active passenger air bag. To use the correct size seat. 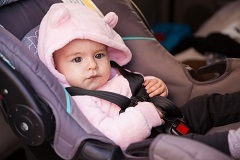 After your child outgrows her forward-facing car seat, make sure she transitions to an appropriately sized booster seat to ensure the lap belt fits properly across her chest and waist. To periodically check the seat for safety. National Car Seat Saturday is a designated day of the year where professionals will assess your car seats to ensure proper installation and use. Getting your seat checked is free, easy, and convenient—simply type your zip code into the inspection station locator provided by the National Highway Transportation Safety Administration, and visit your local station! Although the National day is only once a year (in 2016 it will be on September 24), you can still use the provided website to order brochures and safety pamphlets and some locations will perform safety checks all year round. Your child’s safety is the most important thing in your life. Don’t jeopardize that safety by being uninformed. Take the time to browse our educational articles on car accident risks and avoidance to make sure you’re equipped with the information you need to keep your child safe. You can also spread the word to fellow safety-minded parents by sharing this page via Facebook, Twitter, or email. You never know if it may save a precious life, so go ahead and click now. Post a Comment to "Use Car Seats Properly to Keep Your Child Safe"